Fine motor skills come natural to you and I, but they didn’t always. Think of all the things you do with your hands like tying your shoe, writing, using scissors, or typing on a keyboard…these all take fine motor skills. 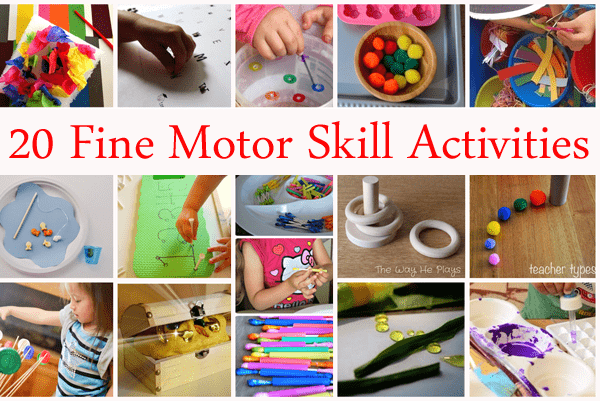 It’s important for children to develop fine motor skills so they can perform the same tasks. At last week’s Love to Learn Linky, we had several activities shared on this topic which inspired today’s list of activities. Thank you to all the bloggers who shared last week, I am always so impressed with everyone creativity! Hi Sue, I love both your activities. We recently did the treasure playdough activity with our J for jewel activities and my kids loved it! Thanks Anne! I love art ideas with a learning twist!